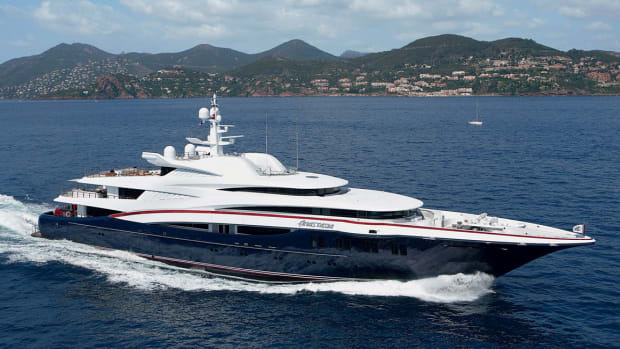 Dynamiq’s M/Y Jetsetter not only looks good, but she also performs at the top of her class. Traditionally, yachts have come in two flavors: planing and displacement. Planing hulls are fast with styling to match, but they have limited range and comfort. Full-displacement hulls offer more comfort underway, but they are generally slow and less exciting to look at. 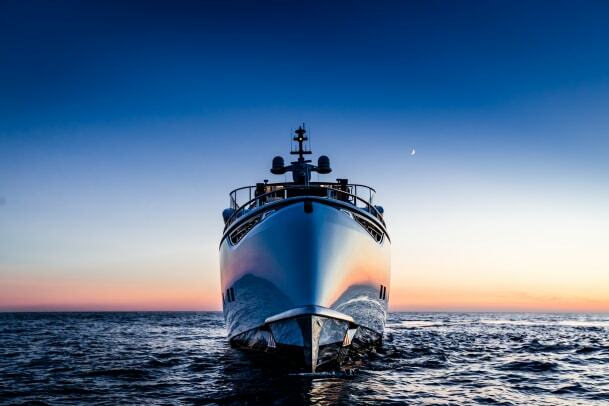 To create the Dynamiq range, Dobroserdov gathered some of the top names in the yacht industry: Azure Yacht Design & Naval Architecture for hull lines, Van Oossanen Naval Architects for optimization and Bannenberg & Rowell Design for interiors. Together, they developed three models that vary in size, volume and performance: the D4, with a top speed of 21 knots; the S4, at the same length overall but with a top end of 25 knots; and the 131-foot (40-meter) D4 L, also with a top speed of 21 knots. 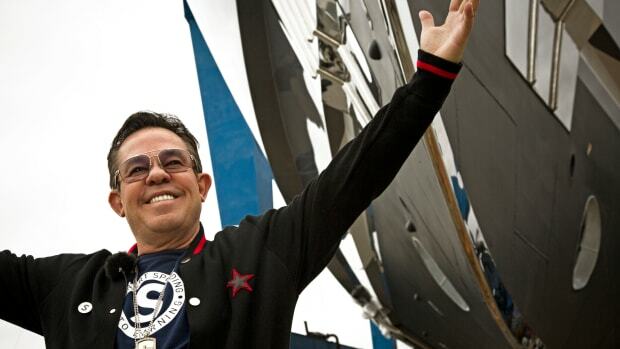 Dobroserdov calls the fleet Gran Turismo Transatlantic (GTT) yachts, borrowing from Italy’s gran turismo cars, which are fast and can cover long distances in stylish comfort. Jetsetter’s reverse bow and fluid lines, inspired by automotive styling, give her a distinctive exterior profile. Her top speed is in excess of 20 knots. At 10 knots, she burns just 80 gallons of fuel an hour for a cruising range of 3,000 nautical miles. 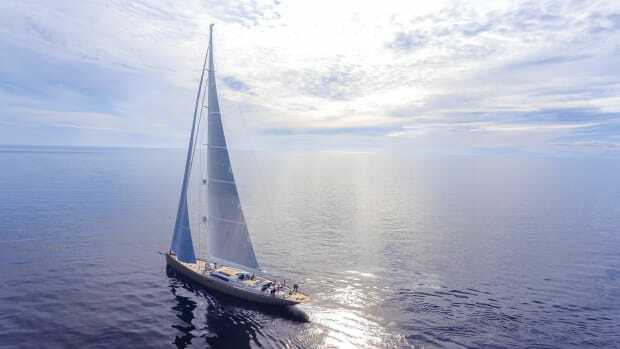 But Dobroserdov’s objective was not just longer range and higher speeds: Although the yacht is compact by superyacht standards, he believes owners should not have to compromise comfort based solely on size. 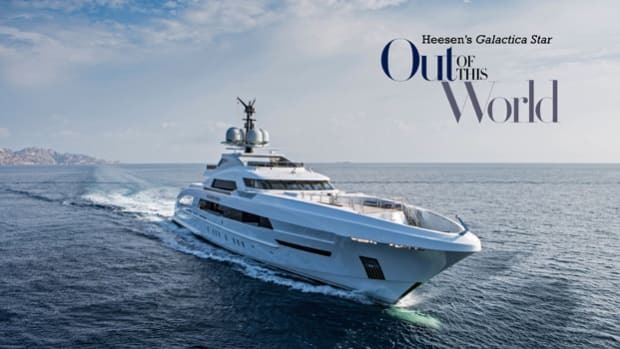 Jetsetter’s ceiling heights of more than 7 feet (2.1 meters) exceed rival brands of equivalent length overall, and Dobroserdov says that aboard Jetsetter, the shipyard used the same marble supplier that Lürssen did on Azzam, the world’s largest yacht. To reduce the likelihood of seasickness, Azure developed the fast displacement hull form by calculating a “comfort index” that includes waterline length, beam, displacement, draft and center of buoyancy. The design team opted for electric, at-anchor stabilizers, which are quieter, more reactive and take up less space than their hydraulic counterparts. With U.S. clients in mind, Jetsetter’s range and relatively shallow draft of 5 feet 9 inches (1.75 meters) make her Bahamas-friendly. The main engines are coupled to Contra Rotating Propeller (CRP) pods for increased efficiency, and reduced noise and vibration from cavitation. The fixed pods, unlike steerable pods, require rudders but provide more thrust at high speed. The result is sound levels of 40 decibels—equivalent to softly falling rain—in the owner’s suite adjoining the engine room when at anchor. Jetsetter earned a RINA Comfort Class notation for her low levels of noise and vibration, and RINA Green Plus certification for low environmental impact. 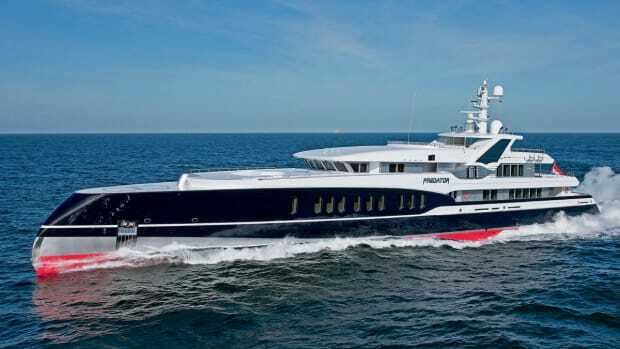 Bannenberg & Rowell integrated its knowledge of larger yachts, developing a fresh, sporty template that can be customized by swapping out materials and finishes, but without falling into the generic design solutions common to most series yachts. M/Y Jetsetter&apos;s main salon. The interior design is by London-based Bannenberg & Rowell with loose furnishings by Italian fashion brand Trussardi. 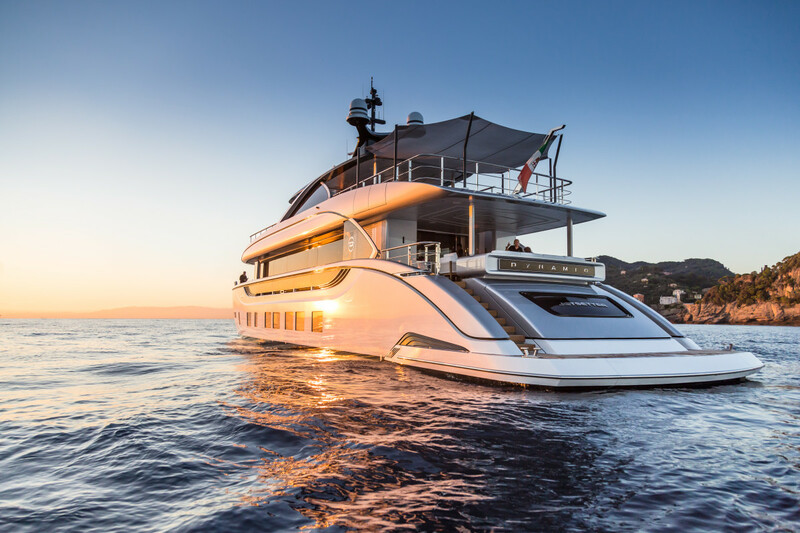 Nuovi Cantieri Apuania built Jetsetter in Tuscany under Dynamiq management. 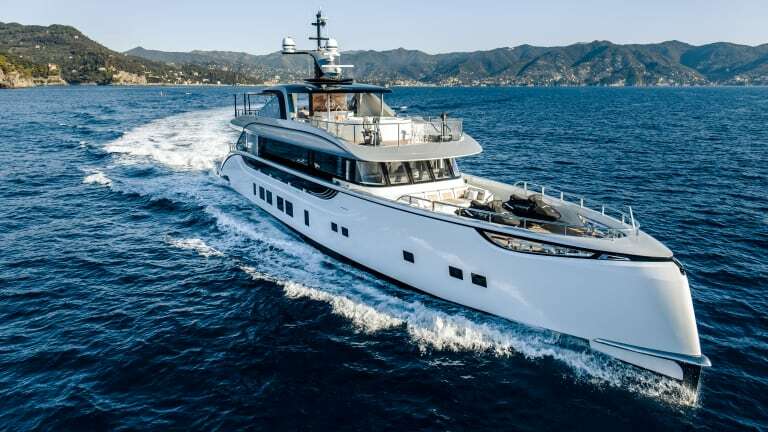 The yard, part of the Italian Sea Group, also launched 180-foot (55-meter) Quinta Essentia, the Admiral E-Motion hybrid developed by Dobroserdov. Jetsetter’s general arrangement went through several permutations before arriving at a four- or five-stateroom layout on the lower deck. The former has the added luxury of a full-beam master suite, and both provide discreet crew access to the guest staterooms for servicing. There is also a dedicated laundry room and a crew dinette. Instead of a beach club, the transom garage houses a 17-foot (5.1-meter) Castoldi jet tender, and the transom door folds down to create more than 320 square feet (about 30 meters) of swim platform. The tender stowage affects the size of the engine room, but the main machinery is readily accessible. 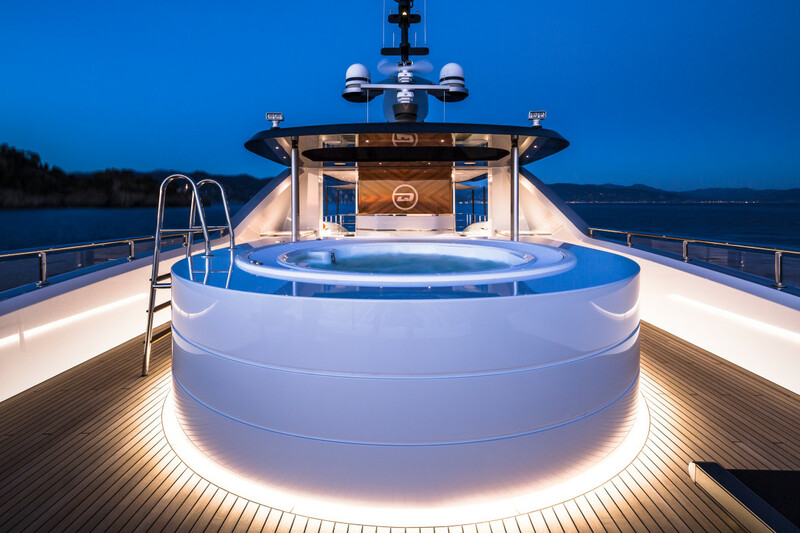 The sundeck has all the features associated with larger yachts, including a hot tub, covered dining area, barbecue, bar, sofas and sun loungers. The sundeck gives the impression of being aboard a much larger yacht. 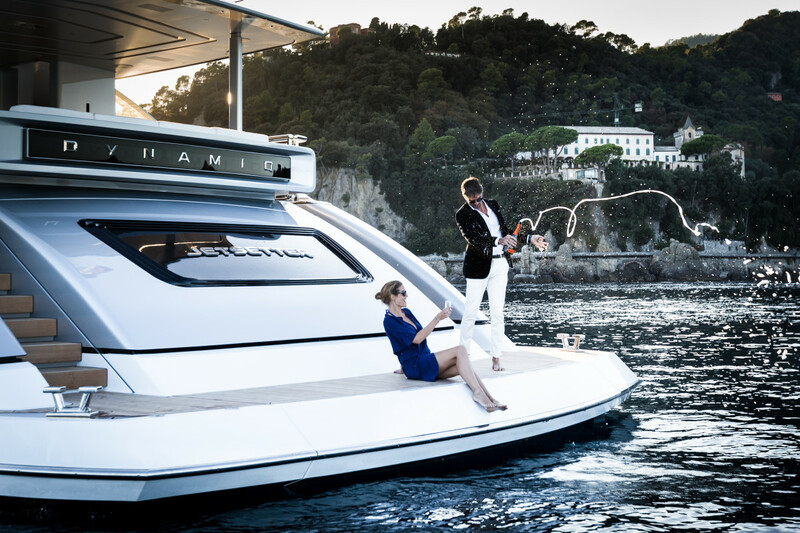 More than offering a range of semi-custom yachts that gives rival brands a run for their money, Dynamiq takes the series concept a step further by tapping into what it sees as a “lost generation” of owners that falls between the markets for composite planing boats and larger displacement yachts. 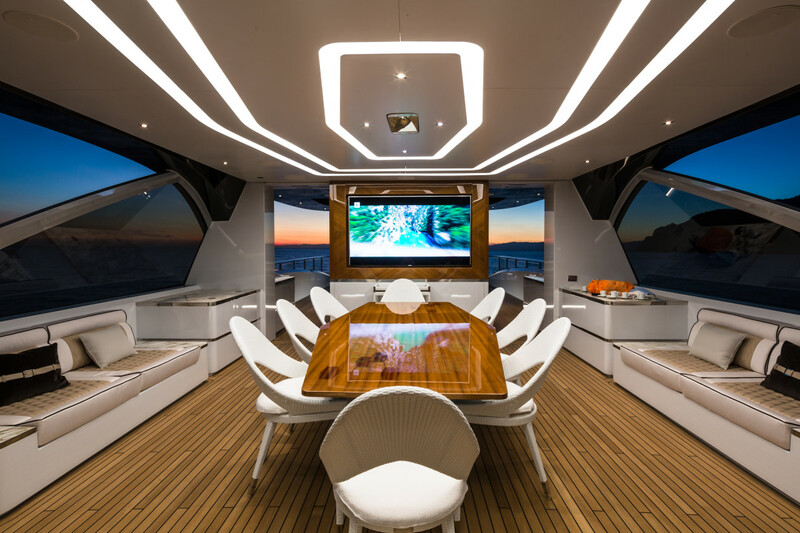 Another aspect of the Dynamiq business model makes it different: Clients can use an automotive-style, online design tool to personalize their yachts. Deluxe and Sport packages are available, or clients can select individual items ranging from exterior paint to interior finish, A/V systems and technical equipment. Clients can select the shape of the hot tub, add water toys, choose crew uniforms and even add a crew car. 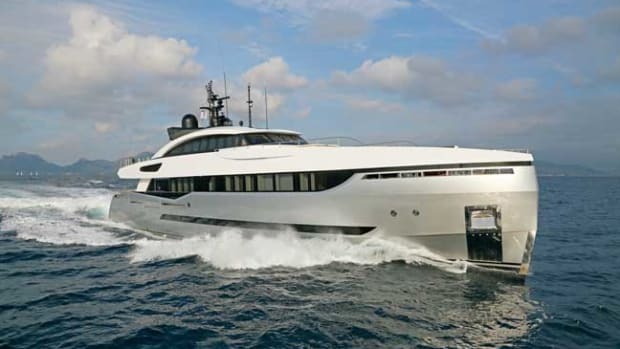 Starting from a base price of around $15.5 million, Dynamiq yachts with these options can be viewed in real time online, with prices for each option displayed. 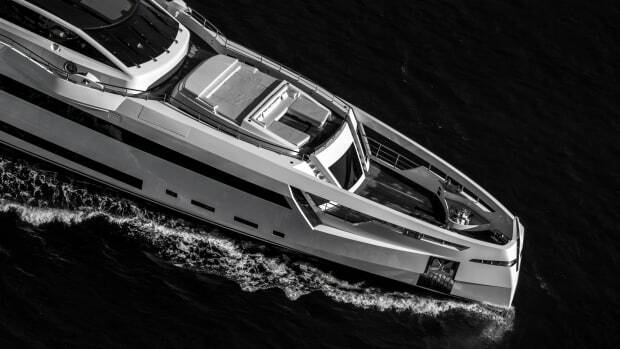 Dynamiq aims to deliver a fully finished yacht in 17 months. This is achievable thanks to the fixed technical platform; the integrated bridge is one of the few areas that cannot be customized. Even still, the ‘build your own’ online tool removes much of the mystery associated with yacht ownership—a further factor likely to appeal to the wealthy Millennials who Dynamiq is targeting.